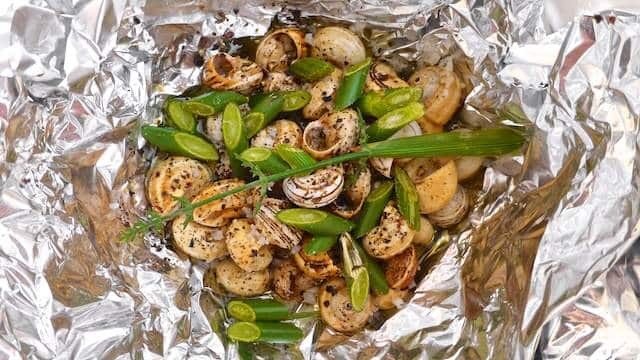 Snails in Malta & Where to Find Them (Marsaskala) | Simple. Tasty. Good. 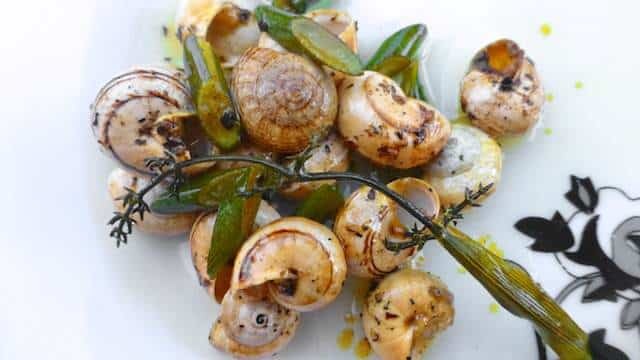 Where to find edible snails in Malta? Our first major day walk started on a windy but warm morning. Our mission: discover the coastal area between Marsaskala (our base camp) and the Marsaxlokk harbor. Pretty windy it proved to be indeed because a handful of locals was posted along the sandy cliffs (where our walk took us) looking out at the steamy wild sea crashing against the rocks. Quite a few addressed us saying that this type of wild sea and the chilly gushes of wind were pretty unusual around this time of the year. Great, thanks. Oh and by the way, we’re from Belgium. We’re sweating our asses off in these temperatures. St Thomas Bay houses a very quiet and simple Maltese village. Nevertheless the abandoned cafeteria and huge concrete parking lot tells us this must be a pretty active spot during the summer holidays. In fact, we came across 3 older English speaking ladies carrying sunbeds, umbrellas and a few thermoses (probably filled with tea) who were looking at the foamy sea and submerged concrete beach as if they had just stepped out of a time machine. We followed the coastline until we reached a sandy pebble lane climbing up slowly in between stone walls. As you work your way up, look around you. See all those snails left and right? This is where you find edible land snails in Malta! Time to fill your pockets (or at least a little plastic bag if you got any). Don’t think of doing it later on. Once you reach the top of the little hill the snails mysteriously vanish. I didn’t see any of them for a few miles. Don’t worry if you’re only starting your walk here. 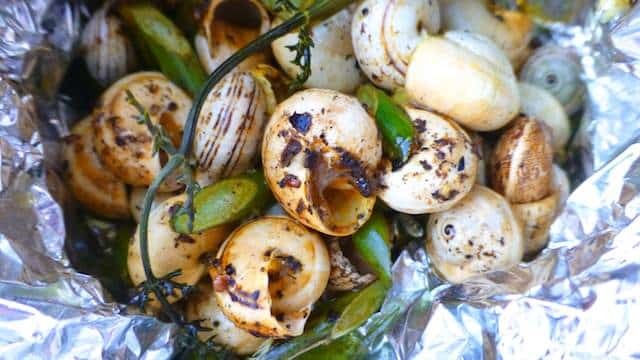 The snails you pick now will definitely make it until dinner. During my walk I also picked some wild fennel. Thought its flavor would go well in combination with the snails. Wild fennel is pretty easy to spot. It’s bright green, has narrow and long sprigs pointing upwards. These can reach to up to 7 feet! Wild fennel also has tiny yellow flowers. 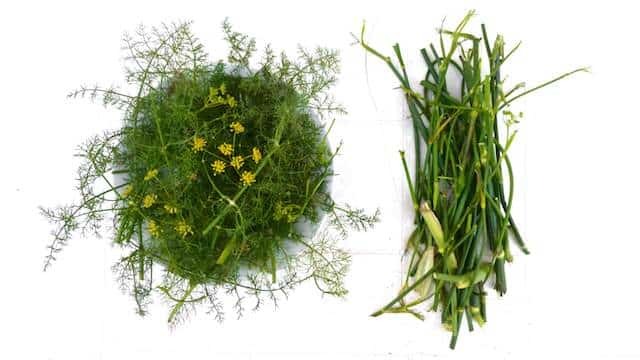 Just in case you’re not sure it is wild fennel, break off a little branch and smell or even taste it. So back to our snails! I came home that evening, opened my bag of snails (upsetting a fair amount of teeny weeny spiders, thought they were ants) and transferred them to a sieve. Cleaned each one of them carefully under cold running tap water and rinsed the whole lot again after that. I let them drain a little and then placed them in the middle of a huge sheet of tinfoil. Sprinkle with some pepper and salt. I happened to have fennel seeds in my cupboard so I added some as well. Rinsed the wild fennel and sliced it up a little. Added it to the snails and wrapped the whole lot tightly. Pop ’em on a hot barbecue for 20 minutes. There you go: a fresh and free appetizer!! Keep those toothpicks close to pry the tasty buggers out. Lovely. I can hear you guys think: how do you know for sure these snails are OK for consumption? I once heard from a snail specialist that there’s only one rule here: does the cooked snail taste bitter, just awful or utterly bland? Discard the poor things. Once you think: hmm these are pretty good, don’t stop until you drop. I didn’t only go hunting for land snails in Malta, I did the same in Tenerife although those were sea snail or periwinkles. Find that recipe here!